After all, it was $2 billion more than the retailer initially wanted to spend. Home Depot (NYSE:HD) has an attraction to its own stock that seems hard for the company to resist. Management began the 2016 fiscal year targeting buyback spending of $5 billion, but the home improvement retailer quickly changed its mind. Executives actually dedicated $6.9 billion to repurchasing shares -- or approximately 90% of net earnings. At a glance, that seems like an overly aggressive commitment of resources for a business that's under constant threat from rival bricks-and-mortar retailers and online-focused challengers. So, let's look at whether Home Depot's capital allocation strategy makes sense in the context of its operating and financial goals. The past year was a strong one for Home Depot's business. The company outgrew Lowe's (NYSE:LOW) by posting a 6% comparable-store sales increase compared to Lowe's 4% uptick. In further good news for investors, that surge came paired with improving profitability. Operating margin jumped to 14.2% of sales from 13.3% in the prior year. 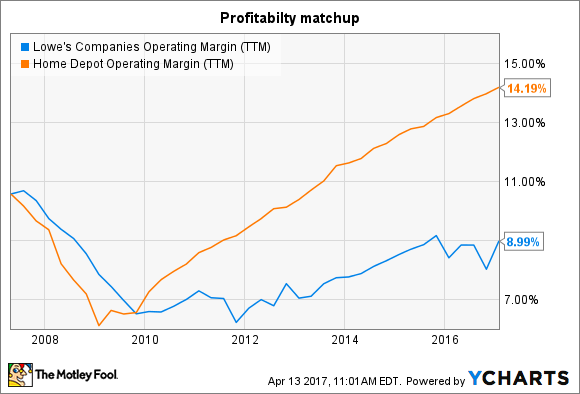 Lowe's profitability, in contrast, stayed stuck in the high single digits. The growth and profitability trends combined to send Home Depot's net income higher by 14% to $8 billion. Cash flow was similarly strong, rising to $9.8 billion from $9.4 billion. Home Depot isn't expanding its store base, so its capital requirements aren't as hefty as Lowe's right now. Yet the business still required major investments in projects like store modernizations, supply chain upgrades, and e-commerce infrastructure. All told, Home Depot plowed $1.6 billion back into the business in 2016, up from $1.5 billion in the prior year. Debt also played a key role in the company's decision to raise its buyback spending. Late in the year, management decided to take on an extra $2 billion of borrowings that added to a ballooning debt burden for the company. Long-term debt is over $23 billion today -- up from $9 billion back in 2011. 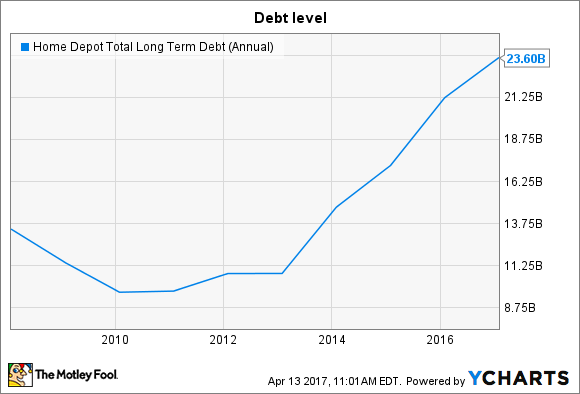 HD Total Long Term Debt (Annual) data by YCharts. That increase isn't as bad as it might first seem, though. For one, interest rates have been low, and sales spiked over this time period, so Home Depot's interest payments remain small relative to the business -- just 1% of sales last year compared to 0.7% in fiscal 2012. Second, Home Depot's targeted use of debt has contributed to an impressive spike in its return on invested capital. That figure passed 31% of sales last year to put the retailer near the top of all businesses on the key efficiency metric. Here's the bigger picture: Home Depot generated $9.8 billion of cash last year that it supplemented with $2.4 billion of new debt. Of that $12.2 billion of available funds, the retailer dedicated $1.6 billion to investments in the business, $3.4 billion to dividends, and, in the biggest commitment by far, $6.9 billion toward stock buybacks. For 2017, executives again forecast $5 billion of buyback spending, but there are good reasons to believe them this time. The company plans to ramp up its business investments to $2 billion, and it also recently announced a major boost to its dividend payment that now targets returning 55% of earnings to investors through dividends rather than the prior 50% goal. Lowe's aims for a much smaller 35% annual payout ratio. Finally, Home Depot is likely on the hunt for more acquisitions to help bolster its position in growth areas like the professional side of the home improvement business. Executives see share gains in that $120 billion market as key to their goal of passing $100 billion of annual sales by 2018. Management's stock buyback decision doesn't seem to rely on share price, given that the spending has been steady at about $7 billion in each of the last three fiscal years. That's why investors can expect Home Depot to rely on that channel as a key part of its capital return program even as it boosts its commitments in other areas.